Sarah, we have your back! When all the world is falling down around us, we look for leaders. We look for those few amongst us that exhibit the characteristics that we wish we had. But we are all human. We have concerns about family, income and our walk with God. We pray that we will be guided to do the right thing. What if we were called to a task that seemed to be in conflict with our primary concerns? What if we were called to leadership on a level that confronted every thing we ever felt was the primary focus in our life? What if we were called to lead our nation? I can’t imagine the thoughts that must be coursing through the Palin family’s mind. Do we take this plunge into national leadership, or do we take solace in the knowledge that we are convicted toward our love of family and stay put? I can only say one thing. Sarah, if you believe that you’re inclined to run for President, we have your back. We can’t be there to guard the door, but we can deliver a withering defense of everything that you believe in. We will defend your family with our dying breath. We will hold Trig up upon our shoulders to acknowledge your commitment to his life, because it is part and parcel to our own. We will stand in defense of everything you say and will stand in the vanguard of your cause. Sarah, we are your avant-garde and will defend you to our lives’ end, in defense of this country, and in all that we call our own. Sarah, don’t ever think that you embark on this campaign without allies. You have so many more than you could ever imagine. It’s not difficult to see that Sarah Palin has defined the kind of presidential candidate she’s looking for in 2012 as… Sarah Palin. We don’t think any others, especially those with Tiffany’s bills substantial enough to support several Bristol Bay native villages for the duration of a long, hard winter, will measure up to her high standards. Those who dwell in many earthly mansions won’t cut it either. No, Gov. Palin is the mama grizzly who, when she wants a job done, will do it herself. 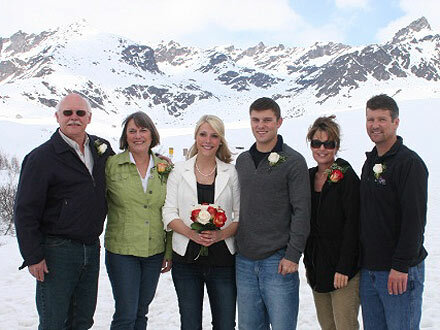 Congratulations to Track Palin, son of Governor and Todd Palin, who married his high school sweetheart, Britta Hanson. The Palin family is growing! 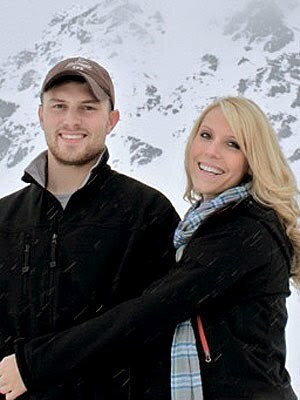 Sarah Palin’s eldest son, Track, 22, recently married his high school sweetheart, Britta Hanson, 21, in a small ceremony in Hatcher Pass, Alaska. The couple will have a larger wedding celebration this winter at Alaska’s Alyeska Ski Resort “when extended family and friends from the Lower 48 can travel north for a long ski weekend,” says the statement from Sarah and Todd Palin and the Rev. Duane and Elizabeth Hanson. Britta and Track have been dating since high school. When Track was stationed overseas in 2008, Sarah Palin used to joke that she hadn’t heard from her son since his deployment, though his girlfriend had. Track is now an Army Reservist who spent a year deployed in Iraq with a Ft. Wainwright Stryker Brigade. He plans to study at the University of Alaska after the commercial fishing season. Britta is a nursing student at the University of Alaska. I wish the new couple all God’s blessings, and as happy as they now are, I’m certain the best is yet to come.